Welcome to Majorleague Ballarat’s fastest growing Indoor Sport – Indoor Soccer. Our purpose-built fully-netted TWO Indoor Soccer arenas were constructed in 2008 and are waiting for you to enter a team or join as an individual. 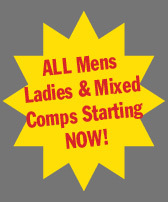 Come for fun or come and play your World Cup – we cater for all standards, Mens and Ladies, Boys and Girls. No experience necessary – just a desire to play soccer and get some fitness at the same time. The two fully-netted arenas makes play fully continuous providing fun for all skill levels and more value for money! Teams consist of 5 players for Seniors and 6 players for Juniors, with up to 3 Substitutes allowed. Substituting is allowed throughout the games so every player gets plenty of action! Mens competitions are held on Sunday, Monday, Tuesday, Wednesday, Thursday and Friday. Ladies competitions on Tuesday, Wednesday and Thursday. Our Mixed competition is played on Sunday evenings. Also, please see our Junior Sports page for days and times for boys and girls and the varying age groups. Come and kick a goal at Majorleague Ballarat’s Indoor Soccer arenas!! !